This is an Administrative function rather than a standard lab operation. Only users with Lab Manager profile have this on their menu and may access it. HealthCloudPOL provides the ability to group Tests into Panels, using the Test Panel management menu item. 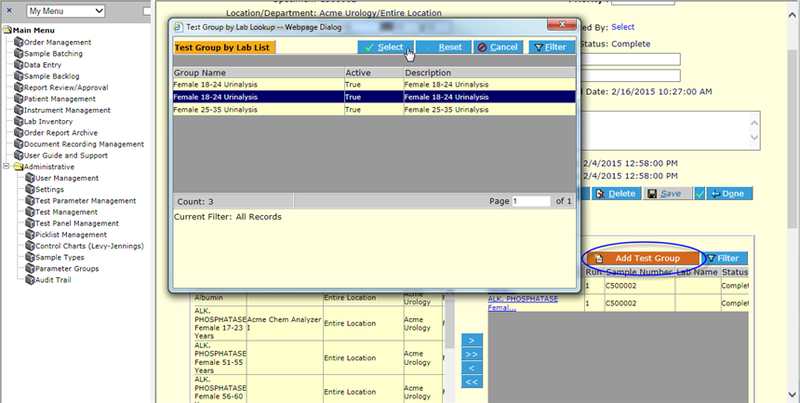 Each Panel, or Test Group is a list of user-defined tests for the same lab location, grouped logically. Test Panels/Groups provide a quick and efficient way to assign multiple tests during order creation and receiving. 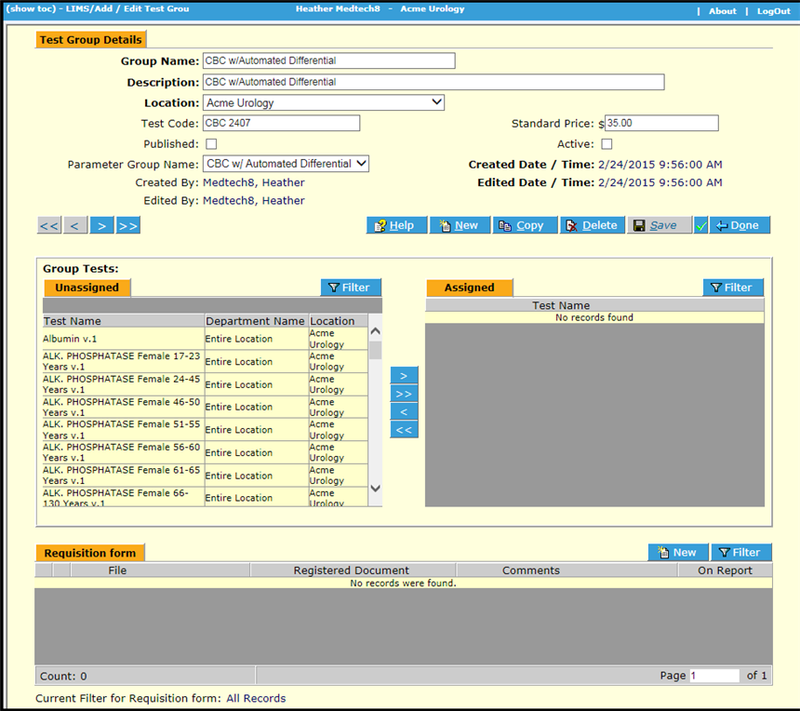 Panels are assigned to specimens in the Order Management section, by selecting a given Order, and then the specimen to which you would like to assign the Panel. In the Sample Test Assignment frame, click the Add Test Group button to display the list of defined Panels or Test Groups. The Test Panel List screen displays Test Groups information currently defined in the system. From the Test Groups List, select a Group Name or click New . In either case, the system displays the Test Group Details screen. Authorized users may make changes to existing Panels and click Save if they are not Published. NOTE: As with Tests, if Panels are Published they may not be edited. To create a New Panel, you can use the Copy function in the Test Group Details screen, making appropriate changes, or, as in the example here, click New on the Test Panel List screen. Complete the fields of the Test Group Details screen. Bold fields are required. Group Name – Choose an appropriate name for this Panel. It is of course important that each Panel have a different name. Description – This can be anything that further describes the panel, or just the same as the Group Name. It is purely informational. Location – Select your lab Location from the drop-down list. Test Code – This is informational. If there is a test code associated with this panel then you can enter it here. Standard Price – Type the pricing information for invoicing purposes. Published – Do not check this yet. Once complete, you can select the checkbox to publish the Test Group. Active – Do not check this yet. Once complete, you can select the checkbox to activate the Test Group. Parameter Group Name – This is a non-required field. There are some pre-defined groups of parameters or analytes. If one is appropriate as a grouping for the results of the tests in this panel to display under on the report, you can select it here. When you are finished, click Save . The system displays the Group Tests and Requisition form areas. From the Group Tests area, click on the test(s) you wish to assign and click the Add Selected button. Alternatively you can use the Add All button. The system assigns the tests(s) to the Test Group (Panel) in the Assigned area. If you wish to remove tests, simply select and use the Remove Selected or Remove All button. 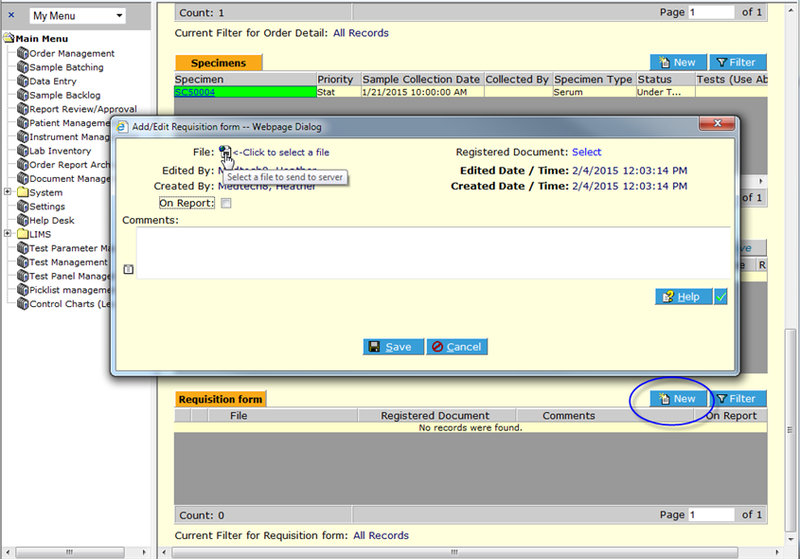 Click the Requisition form New button on the Detail page. The Add/Edit Associated Files dialog displays. If the file you wish to associate is already saved in HCPOL then select it from the Registered Documents. Otherwise, use the File Selection icon to locate a file stored somewhere on your computer or on the local area network (LAN). Once selected, click Send to Server. The file is now associated with the Panel and listed in the frame. When you have finished filling in the information, assigning Group Tests and uploading files, check the Active and Published boxes to make the Panel display in the Test Groups list on the Order Detail screen. From the Test Group Details screen click Save and then Done . The system returns to the Test Panel Management Test Group List screen, where the new Panels display.